I stashed away inside my studio this afternoon and made this card for the sketch challenge over at Freshly Made. Again I am getting this one in under the wire. Whew!!! You would think a simple card like this would have taken about 20 minutes…well…let me just say that it was way longer than that, and this isn’t quite how it started out. A few mistakes are what would you say….hidden. LOL Please tell me you hide your mistakes too? And very often! All in all, even though this design was not my complete intention…I am happy with it! 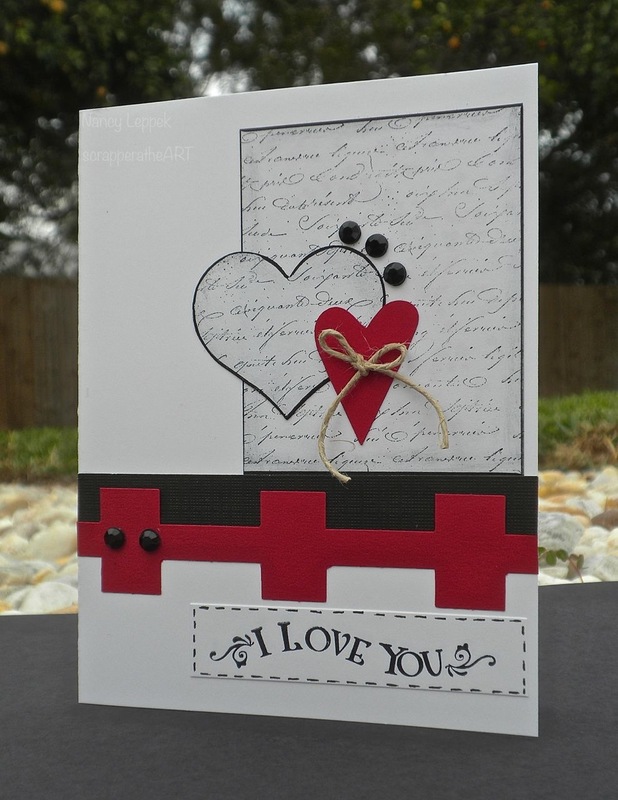 Categories: Cards, challenges | Tags: Card making, Cards, Creative Memories, Cricut, love, rubber stamps, sketch challenge, sketches, stamping, Stamping Up, Valentines Day | Permalink. Nancy, this is an AWESOME card. And yes, I hide my mistakes. If anyone every took apart some of my cards, they’d be amazed…lol. I sometimes find my cards with less on them take me the longest to make. I’m not really good with CAS. Oh, yes…I hide mine too!! Hard to believe there are any here, though! Such a great card! Love the pop of the red with the black/white! Glad you joined us this week at FMS! I think hiding mistakes is an art form in itself! I love this romantic card! Thanks for joining us at Freshly Made Sketches!